How does the Green Bin program work? Organics recycling is an important part of the City of Ottawa’s long term waste strategy. Diverting residential organic waste away from landfill saves the City millions of dollars by reducing the need for a new landfill site. Roughly 45 per cent of Ottawa’s garbage (by weight) is compostable organic material that can be put into the green bin. Just as Ottawa residents separate recyclable materials from their garbage, the Green Bin program makes it easy to separate organics for curb-side pickup. Use the small, specially-designed kitchen container to collect organic materials. Simply empty the organic contents of the kitchen container into the large green bin for curb-side pickup. The organic material is brought to an indoor composting facility owned by Orgaworld Canada located in an industrial park off of Hawthorne Road where it will be turned into compost. The compost is used on farmer's fields in Eastern Ontario. Orgaworld is responsible for the marketing and sale of the finished compost. The City receives 5 per cent of the finished compost. Note that the Ministry of Environment and Climate Change (MOECC) requires that odours not be detectable at the property boundary of the Orgaworld facility. Any odour complaints should be directed to the MOECC. When is the green bin collected? Your green bin is collected each and every week, 52 weeks a year. Residents are reminded to put their green bin and recycling out with their garbage by 7 am for collection on their assigned pick-up day. Lock the lid to prevent animals and pests from getting into the bin. Leaf and yard waste can be used to top up the green bin. It can also be placed in a separate container such as an unused garbage can with the lid off to ensure that collection workers see the leaf and yard waste. Please refer to the Collection Calendar for your collection schedule. Organics recycling is an important part of the City of Ottawa’s long term Waste Strategy. Diverting residential organic waste away from landfill saves the City millions of dollars and reduces the need for additional landfill sites. Your green bin is now being collected each and every week, 52 weeks a year. Plastic impedes the composting process and prevents the flow of air through the organic material, causing it to smell. It also reduces the quality of compost and increases the cost for processing. Plastic residue still needs to be disposed of after composting and increases the amount of material that must be screened out of compost and sent to the landfill. Line your green bin with flyers, newspaper or yard waste paper bags to help keep it clean. Rinse your green bin with a garden hose from time to time, especially if you don’t line your bin with paper. Rinse your green bin with lemon juice, vinegar or baking soda to reduce odours and keep bugs out. Spray your green bin with cooking oil in the winter to minimize risk of items freezing to the bin and ensure easy removal of waste. Keeping your meat or fish scraps in the freezer until collection day helps reduce odours. Keep your green bin away from fences and deck railings so that animals can't get into it. If you do place your bin near a fence or deck railing, secure it with a bungee cord so it doesn’t get knocked over. Sprinkling a strong smelling biodegradable repellent such as vinegar or detergent on your green bin helps keep pests away. Remember to lock the lid to keep animals out of your green bin. Capture fruit flies with a bowl of vinegar covered with plastic wrap with several small holes in it. Empty as required. Peppermint oil, cayenne pepper, chili pepper or hot sauce can act as anti-gnawing repellents and help deter animals from taking an interest in your green bin. Switch your kitchen bin for your garbage pail and keep your garbage pail somewhere else. Keep indoor collection containers in your washrooms. Bathroom tissue, facial tissue and paper towels can be placed in the green bin. Invite the green bin to your next BBQ. It’s a great party guest for food scraps, paper napkins and paper plates. Use newspaper or any other paper-based product (like cereal boxes or waxed milk cartons) to line the bottom of your container(s). Make a homemade bin liner [PDF - 13 KB] from old newspaper. Get the kids involved and have fun with it. One session could keep you in paper bags for weeks. Paper coffee cups and waxed paper coffee cups go in your green bin, not in your black bin or blue bin. They can be used to hold cooking grease or kitchen sink guck before you put these things in your green bin. Clothing and textiles do not belong in your green bin. If you cannot donate this item, it can be disposed of through your regular curbside garbage. Need paper liners for the green bin or kitchen container? While it’s not necessary to use paper liners for your green bin, they are available at most major retailers. You can also use leaf and yard waste paper bags in the larger green bin. Please note: Due to high volumes of yard waste, collection can take place until 8:00 p.m. Please keep yard waste at the curb on your regular collection day. Please note: All leaf and yard waste must be bundled using biodegradable material. Twine or string is the best option. Wire, duct tape and plastic twine will not biodegrade. Leaf and yard waste may not be disposed of on the street, sidewalk, boulevard or in parks in accordance with the City's Parks and Facilities By-law No. 2004-276. Anyone charged with this offence may be subject to a fine. Grass is rich in nutrients and can be used to keep your lawn healthy and fertile. Yard waste and grass clippings make up to 29 per cent of residential garbage during spring and summer. Use your grass clippings to feed your lawn and garden. Grass clippings that are 6 mm to 13 mm (1/4" to 1/2") in length can be left on the lawn. Longer clippings should be placed in your garden or composter. Grass should always be cut before it goes to seed. Clippings are a soil enriching mulch for your garden. Scatter them in thin layers around flowers, vegetables, bushes and trees. Clippings placed in a composter should be mixed with other compostable waste such as leaves, garden refuse and kitchen scraps. Your grass clippings will quickly decompose into rich compost. NOTE: If you used herbicides, leave your grass clippings on the lawn. After the fourth cutting, resume placing grass clippings in your garden, bushes or in your composter. The Green Bins in Schools program continues to grow every year with more than 230 (and counting!) Ottawa public and private schools now registered. The program is open to all elementary and secondary schools, including private schools. There is no cost to your school or school board for participating. Students are able to learn first-hand about what materials are accepted in the green bin and take this knowledge home to their families. Having a food waste diversion program in place at your school earns an additional three points towards your EcoSchools application. Participating in the Green Bins in Schools program helps students learn about and take action on an important local environmental initiative that contributes to the overall health of our environment. Food waste and soiled paper products (e.g. pizza boxes, paper plates, muffin wrappers, paper towels from washrooms) can all go in the green bin. Paper towels with solvents and oil based paints on them cannot go into the green bin. Vegetable or water based ink/paints are acceptable. Bagged leaf and yard waste will not be collected through the Green Bins in Schools program. Where does green bin material go? Organic waste from the Green Bin in Schools program is converted into compost that is sold to the farming community for use as a soil enhancer for agricultural crops. Ensure your school’s principal is supportive of the program, then complete and submit the online application form. If your browser does not allow you to complete the form, please contact Solid Waste Services to request a copy of the application form. A City waste inspector will contact your school to schedule a site visit to review program details and determine the safest and most convenient location for the bins on collection day. It is recommended that the head caretaker and staff involved in managing the program attend the site meeting as important information will be provided about the program. Following the site visit, the City will arrange for the delivery of the required number of containers and educational material. Once the school has received the containers, the program can begin. What happens at the site meeting with the Waste Inspector? During the site visit, the Waste Inspector will explain the program in detail and answer any questions you may have. The collection day set out location for the curbside green bins will be discussed at this meeting and a final location that is away from student drop-off/pick-up zones will be approved. The Waste Inspector will also explain collection day by-law requirements, along with helping you determine the number and size of containers your school will need. It is recommended that your school’s head caretaker and interested teacher(s) participate in the site visit. Bins must be set out by 7:00 a.m. on collection day, and no earlier than 6:00 p.m. the night before collection day. Emptied green bins must be returned to school property by 10:00 pm on collection day. Green bin collection is between 7:00 a.m. and 6:00 p.m. Please note that collection delays could occur during bad weather and/or during peak leaf and yard waste season (early spring and fall). If your green bins have not been collected, please call 3-1-1 or submit an online request via Service Ottawa. Place bins in cafeterias, food preparation areas, classrooms, washrooms and the teachers’ lounge. Minimize odours and avoid fruit flies by emptying indoor bins daily. Wrap food waste and/or use paper liners to keep the bins clean. Students can make origami paper liners for the smaller bins – see the Helpful Program Resources below for details. Hold a program launch event to raise awareness about the program and motivate students and staff to participate. Keep composting messaging top of mind by providing regular program updates, tips and information. Integrate waste diversion into the school curriculum! Involve students from the Eco Club as green bin ambassadors. The City provides program signage for the green bins and brochures/leaflets that provide a list of items accepted in the green bin. A collection calendar that notes the green bin collection day is also provided. If your school needs additional bins, needs to replace damaged bins, or if you would like to arrange a pickup of bins that are no longer needed, please contact Solid Waste Services or call 3-1-1. Your school board environmental contact can provide you with promotional materials and additional suggestions to help improve your program. Green bins are collected weekly. If the week had a statutory holiday, your regular collection day may occur one day later. 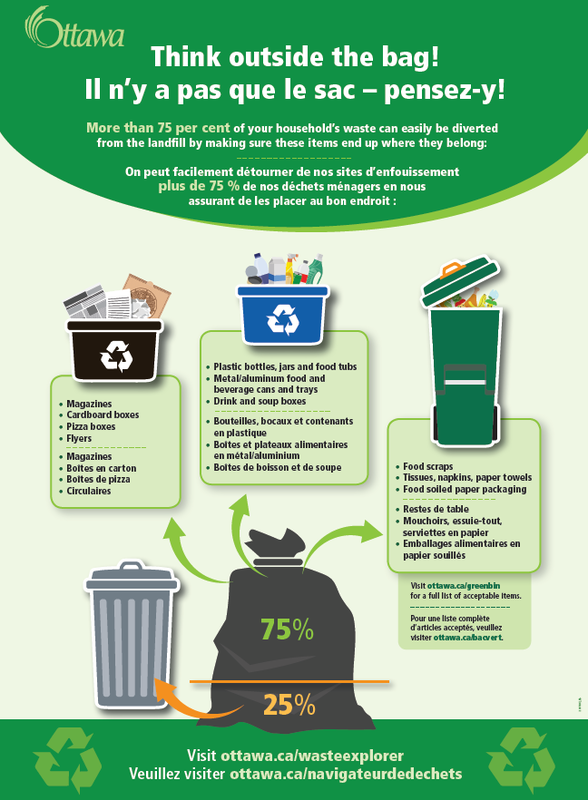 Did you know that 75 per cent of your household’s waste can easily be recycled or composted? In fact, 40 per cent of the waste currently being put in Ottawa’s garbage is compostable organic material that can be put into the green bin. Your green bin is meant for more than just food scraps. Tissues, napkins, paper towels, paper food wrappings and packaging, kitty litter, and animal bedding can all be put into the green bin and saved from the landfill. The Recyclers are here to fight waste and help put recyclables where they belong. Green Bin and its alternate sidekicks – Blue and Black Bin – use their powers to battle against waste every week on collection day. Help Green Bin save items around your home from waste’s grip! Green Bin’s recycling powers keeps organic items from your home out of the garbage and transforms them into compost. Blue Bin and Black Bin take turns each week using their recycling powers to save household waste items from the garbage and turn them into something new. Blue Bin protects glass, metal, and plastic, while Black Bin looks out for paper and cardboard. Visit our YouTube Page and click “show more” for the descriptive video text. Recycling is everyone’s responsibility. If we put the wrong products in the wrong Recyclers, contamination happens and waste wins. Not sure where an item belongs? Check out the Waste Explorer.